The true lover's knot is the name for several knots, including the Middleman's knot, Fisherman's knot and Shamrock knot. 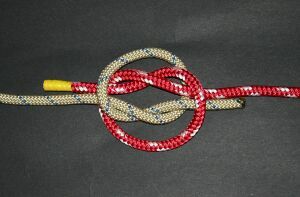 The most popular version, the Middleman's knot, is actually a bend created by interlacing the loops from opposing overhand knots with the opposite line. Legend has it that the Dutch sailors tied this knot to remind them of their loved ones during their ocean voyages in the 16th century. 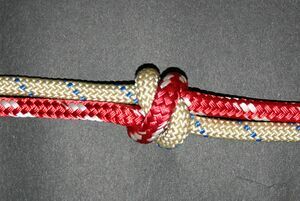 The two intertwining overhand knots symbolize two intertwined lovers. The knot is sometimes used by goldsmiths to make a romantic piece of jewelry. Like true love, the simplicity is deceptive, as this knot is difficult to tie correctly. True lover's knot is also the name of a species of European moth. This page was last edited on 27 December 2009, at 14:47.